Shower tray in acrylic material reinforced with vetroresin, either with borders or inset. Removable floor mat in natural teak, with built-in seat in expanded ployurethane supporting up to 440 lbs. Seat and accessories in five matching colors and support bars in chrome-plated brass. 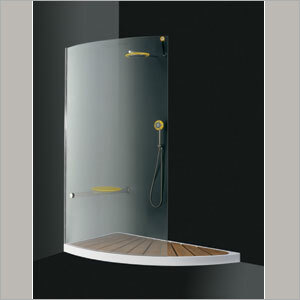 Curved panel in clear 5/16" thick double tempered glass with anti-limescale treatment. Frame in chromed brass.